After spending more than $20 million for conservation, renovation, and upkeep since their contentious 2003 merger, the Autry Museum of the American West has officially put the Southwest Museum on the market. "The future has arrived," Autry president and CEO W. Richard West Jr. told KPCC's The Frame. "I want that site to be viable, in ways that it cannot be [now]." The Autry will maintain ownership of the Southwest's vast collections of Native American baskets, ceramics, blankets, and more — around 400,000 objects total. Most of the collections are currently housed in the Autry's Resources Center in Burbank, scheduled to open by appointment to scholars and researchers in 2020. The Southwest Museum — Los Angeles's oldest museum — has a fraught history. 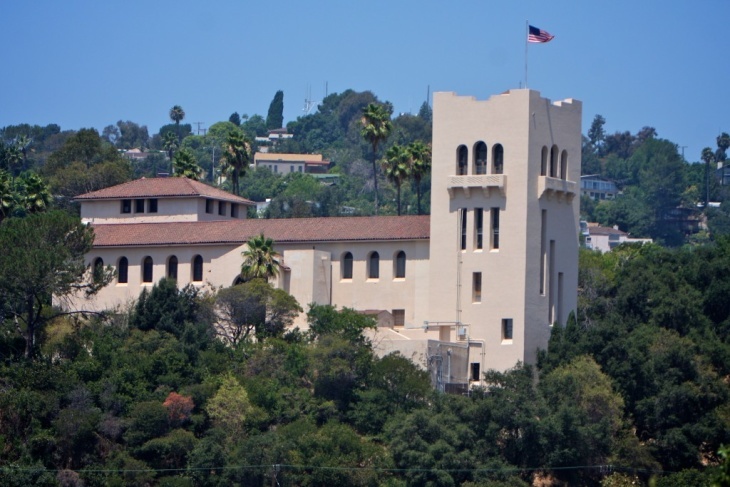 It was founded in 1907 by journalist Charles Lummis, who sought to preserve Native American cultures of the Southwest, and relocated in 1914 to its current 12-acre campus near the Arroyo Seco. The deteriorating buildings sustained further damage in the 1994 Northridge earthquake, and by the end of that decade, was deep in debt and in dire need of renovation. To survive, the Southwest Museum needed a lifeline. Enter the Autry. When the Autry expressed interest in a merger as early as 2001, neighbors and supporters of the Southwest Museum were, to put it lightly, not impressed. The Autry — at the time known as the Autry Museum of Western Heritage — chronicled the American West, with collections that included Hollywood cowboy memorabilia from founder Gene Autry's estate. The museum, founded in 1988, had a big budget and little scholarly achievement at the time. L.A. Times art critic Christopher Knight wrote in 2001, "The cowboys were conquering the Indians. Again." The Southwest Museum shut its doors to the public in 2006, and reopened a small section of the museum to the public for limited hours on Saturdays in 2013. By the time of the reopening, the Autry's West, a member of the Cheyenne and Arapaho tribes and founding director of the Smithsonian's National Museum of the American Indian, had taken the helm at the Autry. The New York Times noted West's hiring as part of the Autry's evolution in 2013: "Make no mistake: the Autry is a major museum, worth seeing for its size, its collections and its possibilities. But it is also worth scrutinizing closely to reveal the difficulties facing the revisionist project here and elsewhere." The Autry made plans to convert the Southwest Museum into a multipurpose cultural center. Critics, such as the Friends of the Southwest Museum, cried foul, citing the terms of the original merger that would keep the collection at the Mt. Washington campus. The L.A. Times editorial board wrote in 2013, "[The Autry] should not turn the Southwest into a garden-variety cultural center until there has first been a serious attempt to rehabilitate it as a museum." In 2015, the National Trust for Historic Preservation declared the Southwest Museum "a national treasure." West applauded the organization, calling them an honest broker in pulling the community together — 87 stakeholders who participated in the process. "This conversation allowed us to be in the position to now to cast the net quite wide," West said, seeing an opportunity in seeking interested parties to take over operation of the Southwest Museum grounds. For now, the Southwest Museum main gallery continues to serve as a conservation lab.